The Ninjas reborn? All new stories, cover to cover! The word on the grimey streets of The City is that the Ninjas are making a new push to rebrand, reform and rebuild with the help of a charismatic and mysterious new leader. The Tick & a reluctant Arthur decide to disguise themselves in Ninja garb and infiltrate one of the secret meetings. 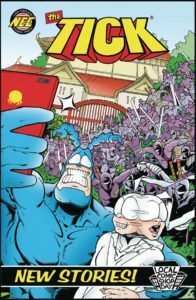 Will the upstart Ninjas see thru The Tick’s rather “out-stretched” ninja costume? Or can our heroes stop the rebirth of the Ninja clans in The City? On sale November 19th at participating Local Comic Shop Day® retailers! #LCSD Event Locator is live!